Are you an ambitious and slightly arrogant intern too? Are you an intern on the way up in the world too? This is the original email strain from this guy. Just as some background info, he was an assistant manager for me last year. I was not hiring him back as an assistant manager per the board members’ request. I was, however, offering him a position as a lifeguard. I have to give my final list of guards to the board and I never got confirmation on whether or not you would like to work as a guard this summer. Is this something you are interested in? Please let me know as soon as possible so I can send my final list. I apologize for getting back to you a few weeks after your previous email. This semester I am employed by BMW as a co-op/intern, handling operations and performing various functions related to test car builds and the testing and eventual release/implementation of new content in upcoming series releases. This is a highly coveted internship that, due to my business prowess, especially that concerning the analysis of different hypotheticals, financial situations, and if-then relationships hinging on international investments, I was able to easily secure without having to bat even a single eye lash. I have been offered a second internship with BMW, a profoundly respected world leader in luxury automobile manufacturing, for this upcoming summer and fall semesters. Obviously, looking to significantly enhance my resume to a level enabling me to one day run corporate America, I will be returning to this prestigious multinational corporation. 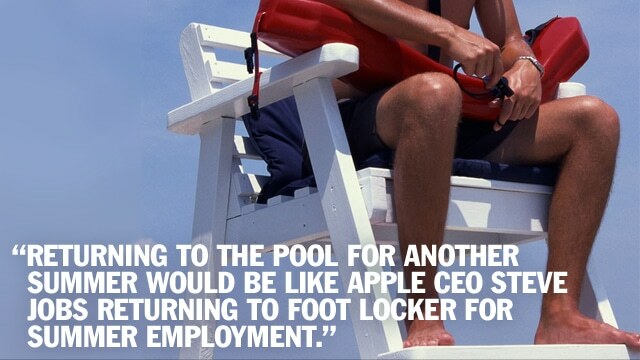 Therefore, returning to the pool for another summer would be like Apple CEO Steve Jobs returning to Foot Locker for summer employment, especially seeing as that returning to the pool would mean being a subordinate to a woman of below average intelligence with the responsibility of teaching “ghetto” school children various topics and subjects that they couldn’t care less about. This would be the equivalent of Bill Gates (Microsoft CEO, in case you were unaware) applying to work as a personal computer salesperson in a local Best Buy retail store. I was never truly interested in managing this summer, but the absence of a job offer for a management position was both alarming and unjust. This is simply a matter of principle. In over half a decade of working at the pool, I can state with much certainty and conviction that I have never encountered a “manager” with such appalling naivety and laughable incompetence until the commencement of your employment the summer prior to the one upcoming. I understand you are a school teacher and not a professor or employed in a position that requires significant knowledge in any particular field of study, so maybe my criticism is unfair. Nonetheless, I still provided much guidance and support as you learned the ropes of managing at the pool at the rate of a snail in the Indy 500. Did I ever complain? No. Why? Due to the fact that I am a professional and, given my advanced knowledge of operations at the pool, I wanted to bestow certain bits of my wealth of knowledge upon you. After vacuuming the pool during early mornings last summer, coming in to work when you were unable to do so, and providing more than adequate instruction and tutelage to you, regardless of your overall lack of competence concerning very basic managerial responsibilities, one would expect that you would question the absence of my name on a list of eligible assistant managers for this summer – a list that includes two people that have YET to serve as assistant managers of the Pool. However, did you do so when informed by [Redacted]? Of course not. You showed no genuine interest in this rather odd and unexpected situation. As I previously mentioned, though feel it is necessary to do so again for reiteration purposes, I provided guidance and instruction to you as necessary, which was a more than commonplace occurrence last summer. By that accord, I am entirely offended and utterly disgusted in your lack of concern for this situation. Do I need a summer job at a local neighborhood pool? No, as I continue my employment as a respected intern/co-op for a dominant player in the international luxury automotive industry. However, this represents a matter of principle and ethics. Unfortunately, you undoubtedly lack even the most basic understanding of these aforementioned concepts. You reap what you sow. Eventually that guy will have to eat his words 10 fold compared to his previous employer being prideful like that.